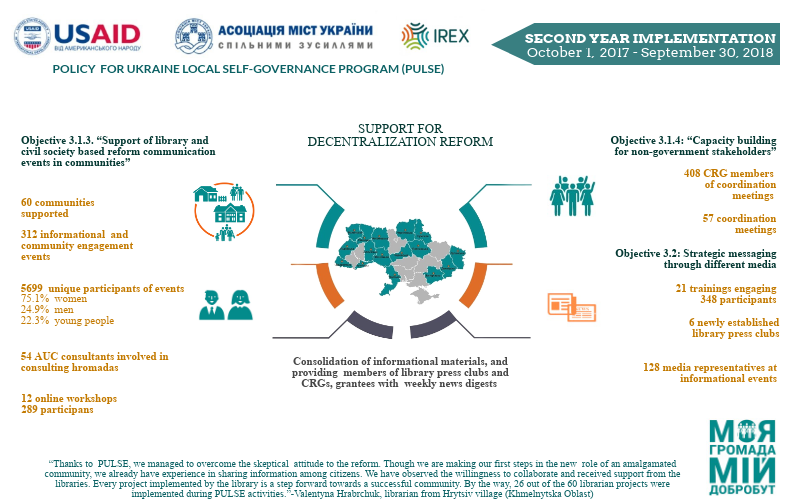 The Policy for Ukraine Local Self-Governance (PULSE) program, implemented by the Association of Ukrainian Cities (AUC) in partnership with IREX, supports Ukraine’s efforts to implement a sound decentralization policy. It strengthens local governance, improves conditions for community development, and promotes stability. IREX helps the reform process, providing information about its implementation in amalgamated communities and building sustainable engagement models for local governments, citizens, and media to promote local ownership of community resources and accountability. IREX has improved and established 60 local, library-based communication platforms for hosting information-sharing events and relevant conversations in participating communities and empowered local civil society and libraries as effective connectors and communicators of local developments related to decentralization reform. To support long-term collaborative relationships between citizens and newly elected self-governing local authorities, IREX has fostered the establishment of 60 new Community Reform Groups in 15 oblasts of Ukraine, many of whom have been able to effectively work with their elected officials on citizen-driven initiatives to solve local problems in their communities. IREX has trained 348 press officers in effective skills for communication with media outlets and equipped them with knowledge on how to create and share engaging informational posts about success stories in local decentralization efforts. Training librarians and activists to communicate about the reform process: IREX prepares librarians and CSO activists to act as hubs for reform information and community engagement events. IREX’s small grants program enables local libraries and CSOs to conduct citizen information and engagement activities and continuously communicate progress and results to citizens. Strengthening the capacity of nongovernmental stakeholders: IREX establishes and supports local community reform groups, representing a mix of leaders of organizations, advocacy groups, professional associations, media, and other key influencers. The groups act as informal local leadership groups and liaise with officials to improve their communities. Engaging local media to promote strategic messaging: The IREX network of libraries across Ukraine engages with local media and community reform groups to stimulate locally relevant coverage of decentralization reforms in each of Ukraine’s oblasts. By working together and mentoring local press clubs, IREX’s PULSE program is reaching new audiences and making sure that local self-governance reform continues to attract public attention.